On Sunday 3rd February, Trafalgar Square will be buzzing with runners about to embark upon the Cancer Research UK London Winter Run. 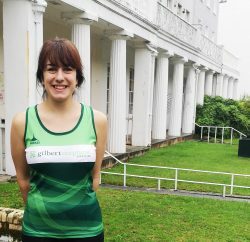 Among them will be Antonia D’Alessio from our Exeter Property Team, wearing the Gilbert Stephens Solicitors colours and running 10k in memory of her mum. The event started in 2015 to raise awareness and funds for the work done by Cancer Research UK. In this time, over 65,000 people have taken part, raising over £2million for the charity and other good causes. The charity say that “the route is full of the sights and sounds of London, every kilometre giving a new experience,” and we are sure that it will be quite the experience. The run will be full of fun, such as a blast of snow at the start line, the Husky High-Five Zone, Penguin Party and the much appreciated Polar Bears, who offer warm hugs and medals at the finish line for victorious runners. Cancer Research UK wants to encourage people to keep active over the winter and to put that to good use by fundraising in events like these, to help beat Cancer. In the 1970’s, less than a quarter of people with cancer survived. But over the last 40 years, survival has doubled; today half will survive. Cancer Research UK aims to accelerate progress so that three in four people survive the disease within the next 20 years. This can be possible if enough people support fundraising events like the London Winter Run. You can even join in from wherever you are with the Virtual Winter Run. You can register on the website and complete your run in stages throughout January to raise money and receive your medal. We wish Antonia and all of the runners braving the winter cold the very best of luck with their sponsored run.